On November 3, 2015, a tight race to achieve full funding of public schools across Mississippi was lost. 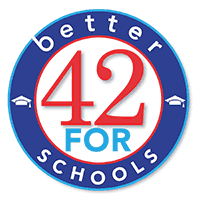 Initiative 42, the ballot initiative for “better schools,” was a citizen-led campaign with bipartisan, grassroots support for fully funded public schools. On November 3, 2015, a tight race to achieve full funding of public schools across Mississippi was lost. Initiative 42, the ballot initiative for “better schools,” was a citizen-led campaign with bipartisan, grassroots support for fully funded public schools. Nearly 200,000 Mississippians from across the state signed a petition to place Initiative 42 on the ballot. Mississippi's public schools have been underfunded and under-performing for years. Their students, especially in the state's poorer districts, face inequitable learning environments and lack the real opportunity to learn that could help encourage their future successes. Despite these very real problems, however, Tuesday's election failed in passing Proposition 42, a proposed constitutional amendment that would have required adequate and efficient funding of the state's public schools. Yet while the parents, students, educators, and advocates who led the campaign for the amendment are disappointed, they aren't giving up on Mississippi and the educational future of its children. Mississippi's public schools have been underfunded and under-performing for years. Their students, especially in the state's poorer districts, face inequitable learning environments and lack the real opportunity to learn that could help encourage their future successes. Despite these very real problems, however, Tuesday's election failed in passing Initiative 42, a proposed constitutional amendment that would have required adequate and efficient funding of the state's public schools.